So you need a dog kennel? Well we will do you one better, how about a dog kennel that doesn't look like a rusty old cage! Puppy love has beautiful wire dog kennels in different colors and sizes! We also carry soft sided portable crates which are great for trips and vacations! A dog kennel is a necessity for anyone who is crate training, containing their rambunctious puppy, or just want their dog to have a safe place to call their own! Easy fold up is perfect for caging on the go! 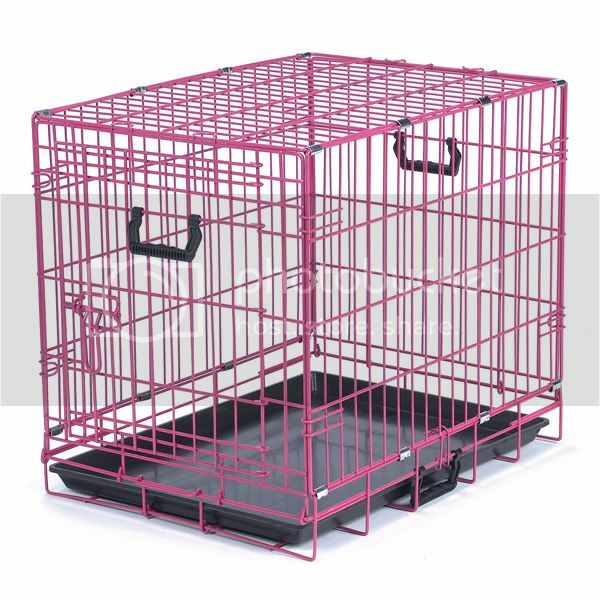 Our dog crates are made of super-strong, epoxy-finished steel with tighter bar spacing for added strength. Ideal for house training, travel, keeping unsupervised dogs secure, and providing a secure place for dogs to rest. Innovative security-latch design helps to keep dogs safely contained. Slide-out floor tray is easy to clean. Included divider panel lets you section off a portion of the crate--discourages pets from sleeping on one side and using the bathroom on the other. Stops dogs from peeing in cage!